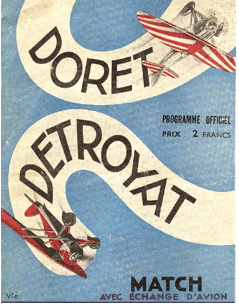 An aerobatic contest between Michel Detroyat and Marcel Doret was the principal attraction of the aviation meet ing at the Vincennes Polygon on April 29. This contest was the result of a challenge by Doret after Detroyat had won his inter national match against Fiesler last autumn. Perfect weather attracted a record crowd, and some 150,000 spectators were ranged deep in the enclosures and packed in the three grandstands. About ten miles of iencing was, incidentally, necessary for the partitioning of the Polygon. 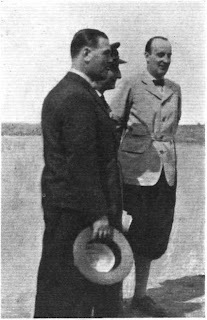 The meeting was organised and managed by the A'r Propaganda Association under the auspices of Le Petit Parisien, and the pro gramme also included a competi tion for the International Feminine Aeronautical Aerobatic Cup, the exhibition of various types of machines and power gliders, simultaneous jumps of six parachutists from three different machines, and a stunting exhibition by Gerd Achgelis, the German pilot. Shortly after 11 a.m. the meet ing opened with the International Feminine Cup event. For this there were also considerable cash prices offered by the manage ment of the meeting, and thtrc were two entries, Helene Boucher, flying a Morane Saulnier high wing monoplane, type 230 (230 h.p. Salmson radial), representing France, and Liesel Bach, piloting a Klemm low wing monoplane (150 h.p. Siemens radial). Although the French aviatrix gave a re markably good exhibition, she had not had the training and experience of her German competitor, who won the event. The afternoon programme opened with the " exhibition." First, the ancient and honourable Farman pusher, of pre war construction, and known as " the bird cage," encircled the field with the " old timer," Louis Gaubert, at the controls. It presented a strange contrast to the Pobjoy Comper " Swift," which, piloted by Georges Reginensi, flew at several times its speed. Maryse Hilz, who had just returned from her Paris Tokio Paris flight with her Breguet all steel two seater, sesquiplane, type 27, and the Caudron which recently established a new record, were among the machines that were demonstrated. The " gliders " were represented by two machines with 6 h.p. engines constructed in Belgium under a licence from the B.A.C., piloted by Henry Machoulas and George Hanet. Then Gerd Achgelis gave one of his well known exhibitions of " almost dangerous " flying. He would dive almost to the " deck," level off, roll over, and fly the length of the field on his back; he would zoom up again, execute a stalled turn, and repeat the performance. His machine was a Focke Wulf " Stieglitz " bi plane, equipped with a Siemens air cooled engine of 165 h.p., with biconvex wing section specially designed for acrobatic perform ance. It weighed but 1,200 lb. (550 kg) in comparison with the 2,530 lb. (7/50 kg) of the Detroyat machine, and 3,200 lb. (i 450 kg) of the machine flown by Doret. 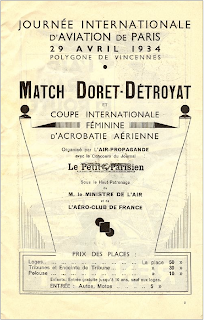 Finally, the event of the day— the Detroyat Doret match. The regulations had been prepared by the Contest Committee of the Aero Club of France, in accordance with the Code of the F.A.I., and a cup of the value of 5,000 francs was presented again by Le Petit Parisien. Commandant Willy Coppens, Chevalier d'Houthulst, the Belgian Air Attache stationed in Paris, was named as umpire. The match was divided into two sections. In one of these, each contestant flew his own plane; in the other they exchanged machines. The first section was in turn divided into two parts. During the first, for which a period of nine minutes was allowed, ten figures were required.